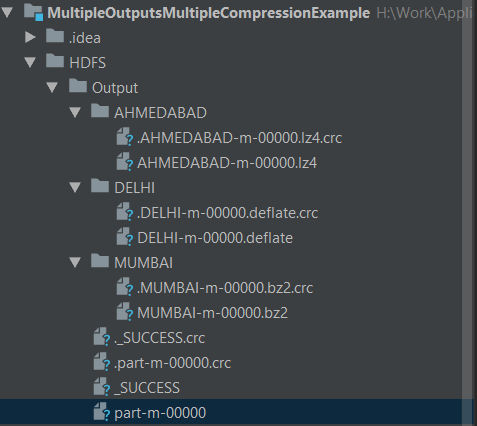 Sometimes we require that our Hadoop job write data to multiple output locations with a different compression method. Hadoop provides facility to write the output of a job at a different location based on our needs using MultipleOutputs class and we can create Custom Output Formats and configured it with MultipleOutputs to support multiple compression formats in a single job. In this article, we will discuss Hadoop MultipleOutputs with a different compression format with an example. Hadoop framework supports many compression formats for both input and output data. A compression format or a codec(coder-decoder) is a set of compiled, ready to use Java libraries that we can invoke programmatically to perform data compression and decompression in MapReduce job.Each of these codec implements an algorithm for compression and decompression and also has different characteristics. MultipleOutputs class provide facility to write Hadoop map/reducer output to more than one folders. Basically, we can use MultipleOutputs when we want to write outputs other than map reduce job default output and write map reduce job output to different files provided by a user. The first step is to create custom output writer class by extending OutputFormat class and override getRecordWriter method. Next step is to create custom record writer class by extending classRecordWriter. The final step is to configured custom output format class as MultipleOutputs named output. Refer below code snippet for more details. clean & install maven goals. If everything is going well, MultipleOutputsMultipleCompressionExample.jar file will be created under a target folder. here are the commands to create a new directory and copy a local file into HDFS for further processing. Now it’s time to run our Multiple Outputs with different compression method Example. Go to your MultipleOutpusMultipleCompressionExample.jar location and run below commands. Once we run above command, Map Reduce job started and output will be written in HDFS in city wise separate folder with LZO, Deflate and BZip Compression. In this article, we have discussed Hadoop compression formats with an example. Here we have discussed how to create a custom Hadoop output format, record writer classes and set different compression format in a single map reduce job with an example. You can also check our Git repository for Hadoop MultipleOutputs With Different Compression Format and other useful examples.